It should be US space policy that we will fund the development of our own, end-to-end, commercial transport of cargo and crew to the lunar surface including surface telerobot is and habitation systems. Then, we should invite any other country to do likewise. Find their own companies to create redundant, dissimilar elements to compete with our companies to keep them honest. In this way, respect would be based upon what the countries can offer while being cost-effective. Clearly Russia is trying to negotiate for something. I hope their desires are clearly expressed to NASA, ESA, etc., cuz it sure isn’t clear in their public comments. If they want something SPECIFIC, they might be able to get it. On the other hand, if they are fishing to see what they can get – that might not lead to an outcome they are happy with. Actually, Rogozin may have been quite specific about what Russia wants. It is the same thing that Russia wanted in 1993, when they were treated like Neekulturny yokels that didn’t deserve what they wanted, …Respect. The Russians, ever since they escaped the Mongol Yoke, have spent a *lot* of time on that subject. The problem now comes that they are asking for Respect from a new generation of US politicians who have experienced 25 years of growing tensions with Russia since the 1993 cancellation, without even informing the Russian side, of negotiations to replace the ABM Treaty with a GPALS Joint System in orbit. How we give them what they want, while standing up an equivalent to China’s “Strategic Support Force”, is not at all obvious after the last 25 years of history. That 25 years may be looked at in Russia as making clear that Russia is not some nation of losers, to be easily given the brushoff. Here, of course, it looks like naked aggression and trying to regain the losses of the old Russian Empire. Telling which it really is must take into account factions inside Russia. There is the real problem. And that’s part of the problem: they always use the word “respect” as a generic catch-all, but in reality they want something very specific. Be it a specific orbit, or to use some specific hardware, or for a certain fraction of cosmonaut involvement – those are all concrete items that can actually be bartered. Could a cargo commitment be met with Angara heavies and some Progress derivative? Can their airlock module be launched on SLS? Part of the problem is that Federatsiya’s schedule is such that the first cosmonaut to Lunar orbit would ride on a US/European rocket combo – which is distasteful for a number of reasons. How does ‘respect’ manifest itself in the bargaining process? I don’t think the overall architecture of the Gateway can significantly change – so what does Russia want before they are willing to sign on? Whatever!!! They want to be treated as an equal to the United States and China…which they are clearly not. Dump the dictatorship and institute the rule of law…and we’ll give them plenty of respect. Excellent idea, and for reasons not the least of which is that it would pretty well ace the Russians out of any portion of cis-lunar space above LEO, that being all they will shortly be able to afford – if that. The Russians are, in essence, asserting a perpetual right to be a major space player based on their glorious accomplishments during the high watermark portion of the Soviet Era. They will, of course, offer nothing in return and continue to insist on their right to be generally belligerent and meddlesome beyond their shrunken borders as they see fit down here on Earth. My bet is they want us to pour money into their various programs and not give them any lip when they’re late or divert some of the funds to dachas and the like. Like the French, they’ll want to be in charge. They also want us to foot as much of the bill as we can while they keep all the IP and technology. Just like we do with the Chinese. From their POV it’s probably humiliating that we empower China at our own expense but won’t do so with Russia. I think a good mixture for any nation’s space program should be 80-20. 80% inhouse, 20% work share. That 20% would make use of the centers of excellence in allied nations. All great ideas on the part of Mr. Rogozin and company, but how will they pay for it? No competition is needed for the Moon. Historically all cooperation produces is long term stagnation as the ISS shows. It’s foolish to extend it to the Moon with the Gateway or even worst, a lunar base. They won’t. They’d obviously like us to pay for it. We’d be idiots to do so. 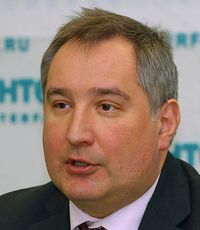 Dmitry Rogozin: poster boy for “mutually respectful cooperation”!! !